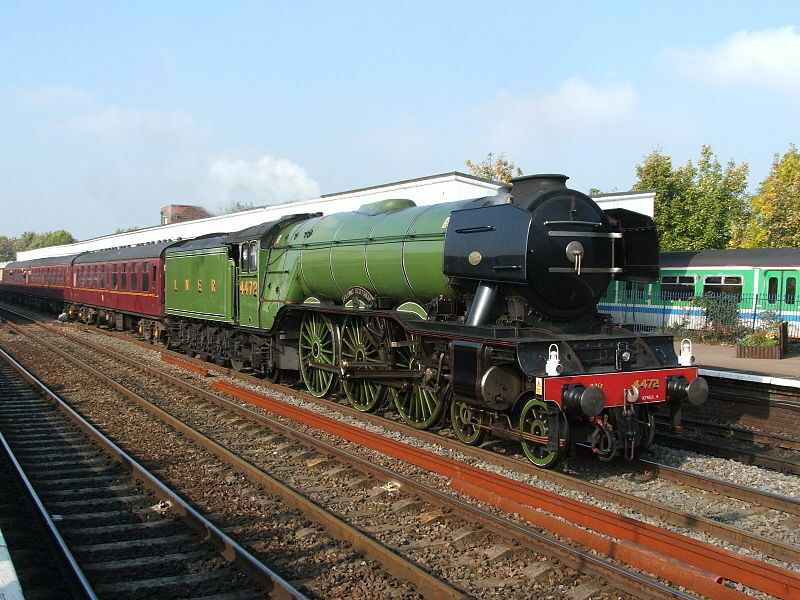 In 1963 Flying Scotsman Number 60103 finished working.Proposed to be saved by a group called “Save Our Scotsman”, they were unable to raise the required £3,000. Luckily Alan Pegler, Having first seen the locomotive at the British Empire Exhibition in 1924, bought Flying Scotsman using money he had received for his share holding when Northern Rubber was sold to Pegler’s Valves. He spent the next few years spending large amounts of money having the locomotive restored at Doncaster Works as closely as possible to its LNER condition: the smoke deflectors were removed; the double chimney was replaced by a single chimney; and the tender was replaced by one of the corridor type with which the locomotive had run between 1928 and 1936. It was also repainted into LNER livery, although the cylinder sides were painted green, whereas in LNER days they were always black. Peglar then persuaded the British Railways Board to let him run enthusiasts specials, And it worked a number of rail tours, including a non-stop London–Edinburgh run in 1968 – the year steam traction officially ended on BR. Then in September 1966 Pegler purchased a second corridor tender, and adapted as an auxiliary water tank; retaining its through gangway, this was coupled behind the normal tender. In October 1988 the locomotive arrived in Australia to take part Australia’s bicentenery celebrations as a central attraction in the Aus Steam ’88 festival. During the course of the next year it travelled more than 45,000 kilometres (28,000 mi) over Australian rails, concluding with a return transcontinental run from Sydney to Perth via Alice Springs. Other highlights included Flying Scotsman double-heading with NSWGRPacific locomotive 3801, a triple-parallel run alongside broad gauge Victorian Railways R class locomotives, parallel runs alongside South Australian Railways locomotives 520and 621, and a reunion with GWR 4073 Class Pendennis Castle in Perth. 8 August 1989 Flying Scotsman set another record en route to Alice Springs from Sydney, travelling 679 kilometres (422 mi) from Parkes to Broken Hill non-stop, the longest such run by a steam locomotive ever recorded. A plaque on the engine records the event. Returned to the UK, by 1995 it was in pieces at Southall Railway Centre in West London, owned by a consortium that included McAlpine as well as music guru and well-known railway enthusiast Pete Waterman. Facing an uncertain future owing to the cost of restoration and refurbishment , salvation came in 1996 when Dr Tony Marchington, bought the locomotive, and had it restored over three years to running condition at a cost of £1 million. Sadly in September 2003 Marchington was declared bankrupt and CEO Peter Butler stated that the company only had enough cash to trade until April 2004. The locomotive was bought in April 2004 by the National Railway Museum in York, and it is now part of the National Collection. it ran for a while to raise funds for its forthcoming 10-year major boiler recertificationn In January 2006, Flying Scotsman entered the Museum’s workshops for a major overhaul to return it to Gresley’s original specification and renew its boiler certificate.In 2013 The locomotive was moved to Bury work to return it to running condition by 2015. Sadly this is taking longer than expected because the repairs are proving prohibitively expensive and may not be economically viable thus Flying Scotsman’s future looks uncertain.